This year one of the most favorite holidays of Armenian Apostolic Church St. Sargis Day is celebrated on 23rd of January. Traditionally on the eve of the Day unmarried girls eat salty lobe wishing to see their future husbands in their dream. By force of that habit Armenians believe to that divination, which will may make people of other nations to just smile. Generally, people who communicate only with their nation’s culture, usually get surprised by the holidays and traditions of others. Whereas among existing in the world holidays there are unique, sometimes odd, but very exciting phenomena. The holiday originated in 1995 in the United States: two friends became so involved with various stories about pirates, that they started constantly talking about it. Later, their hobby infected others and went out from that fold of friends. 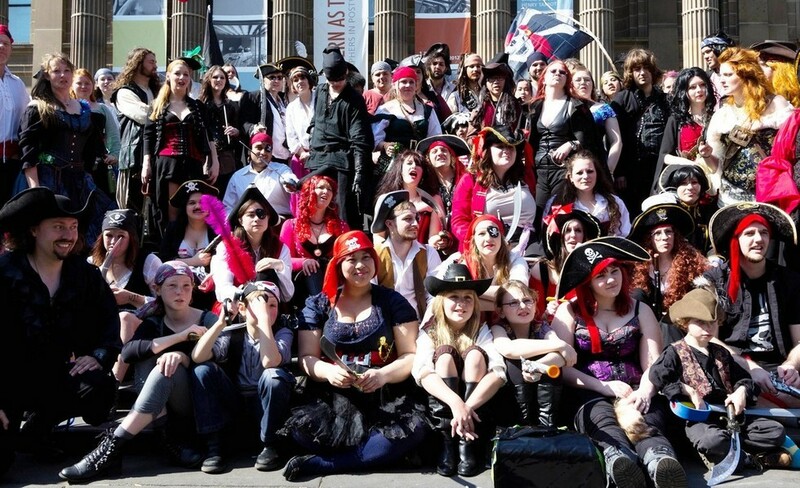 Moreover, it widely spread in Internet and now on 19-th of September in different corners of the planet one can meet people wearing pirate clothes, who speak using that odd lexicon of pirates. The holiday is celebrated in Lopburi Province, Thailand. Every year nearly 600 monkeys participate in this event. The locals "invite" them to dinner near the temple of God Rama. 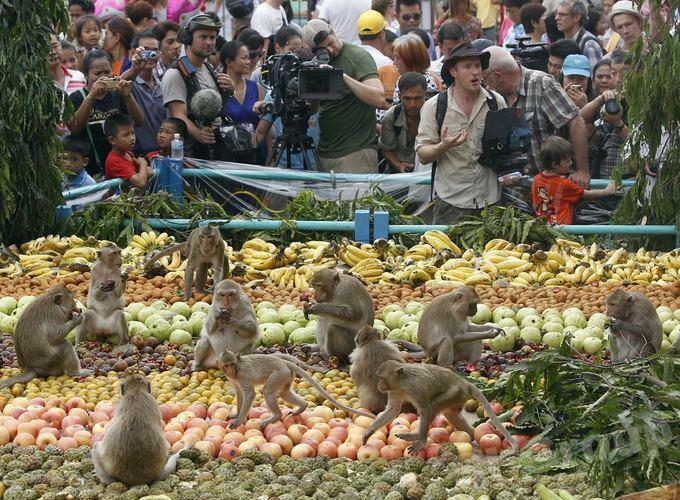 The locals of Lopburi provide monkeys with sweets, fruits and other food. According to the residents, their donation brings good luck to the community all the year. Let's paint each other. The festival of colors in New Delhi. This Indian national holiday is dedicated to the arrival of spring, to the rebirth and also to the eviction of evil. The two-day celebration begins at the full moon, because, according to legend, the spirit of evil Holika died on that day. The holiday is celebrated almost in every town of India. People kindle huge bonfires to symbolize the end of winter and the death of evil spirits. Indians burn the scarecrow of Holika. And In the morning there begins the feast. 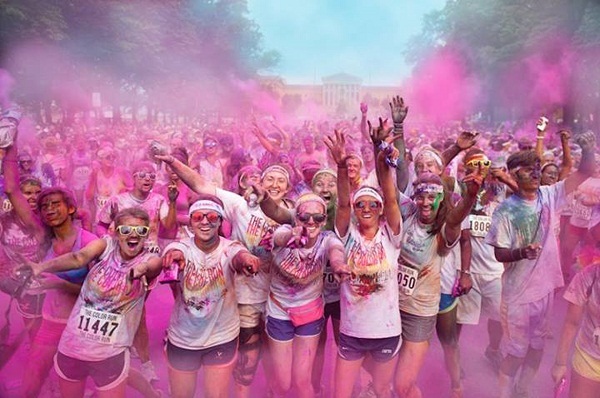 People throw colorful pouches and splash colored water on each other. The annual festival, which is being held since 1945, is held in the town Bunyol not far from Valencia. 40 000 tourists around the world arrive there to take part in the War Festival. The main "weapon" in the battlefield is tomato. A week-long festival includes the passionate Spanish dances and colorful fireworks. 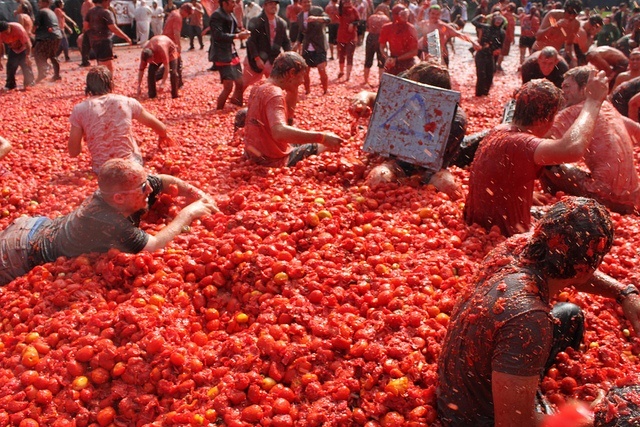 During this holiday 1 000 tons of tomatoes color the streets of Bunyol in red.